We recommend doing these exercises under or in view of an oak tree. If that isn't possible, visualise an oak tree. The energy of the tree strengthens the positive effect of the exercise. a) Place your feet hip-width apart. Quickly turn your head from left to right as if you were shaking your head. Keep your eyes shut and turn your eyes to your third eye, between your eyebrows. Breathe long and deep. 1 minute. Then quickly raise and lower your head as if you were nodding. You are stretching your throat and neck. Focus and breathe as before. 1 minute. 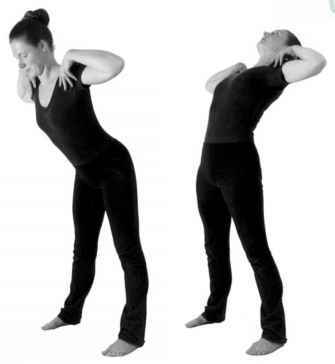 This exercise loosens the neck and energetically replenishes the brain. b) Weightless running. 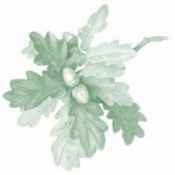 Support your hands on the tree trunk, on a knee- or hip-high stool, or a windowsill. Run on the spot, kicking your heels into your bottom muscles as you run. Breathe long and deep. 3-10 minutes. This exercise improves the circulation in the legs. c) Place your feet 50 cm apart. As you breathe in, swing your left arm straight over your body to your right thigh without moving the rest of your body. At the same time, holding your right arm at a 45-degree angle, swing it backwards. Repeat these movements in the opposite direction. Keep your eyes shut, and direct them to your third eye. 3 minutes. This exercise integrates the right and left sides of the body. a) Place your feet about 65 degrees apart and put your hands on your thighs. Breathe in, stretch your legs, and keep your upper body horizontal. Lift your head away from your shoulders and stretch your throat. Maintaining the same position with your upper body, straighten your knees as you breathe out. As you breathe in, bend them again. Keep your back straight. Repeat in rhythm with your breath. 2 minutes. This exercise strengthens the thighs. b) Place your feet hip-width apart; bend to the front with straight legs and put your hands around your calves. (If you have back problems put your hands on your knees or thighs.) Breathe in and lift your head away from your shoulders, and bend your spine downwards so that it resembles the bowed back of a cow, while raising your bottom up. Breathe out and bring your chin down to your chest, round your back like a cat, and pull in your stomach. Keep your eyes shut. 3-7 minutes. This exercise tones the back and increases flexibility. c) Place your feet hip-width apart and put your hands on your shoulders with your fingers pointing forwards and your thumbs backwards. Lift and hold your pelvic floor muscles. As you breathe in, stretch backwards at a 30-degree angle from your hips. As you breathe out, do the same forwards. Keep your eyes shut. 2 minutes. This exercise cleanses the nerves and liver. d) Place your feet hip-width apart; place your hands on your shoulders with your fingers facing forwards and your thumbs backwards. As you breathe in, turn your upper body and head to the left; as you breathe out turn them to the right. Shut your eyes and direct them to your third eye, between your eyebrows. Keep your spine straight. 2 minutes. This exercise is both centring and increases the coordination between the two hemispheres of the brain. 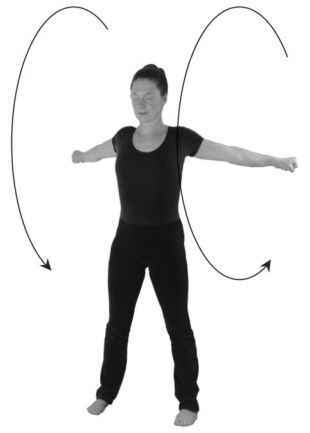 a) Place your feet hip-width apart; make a fist with both hands and swing your outstretched arms forwards in large circles. Shut your eyes and breathe long and deep. 1-3 minutes. This exercise cleanses the aura and coordinates the five brain centres. 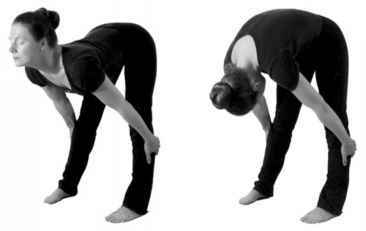 b) Place your feet about 60 cm apart; bend your upper body forwards and hold it horizontal to the ground. Lift your head away from your shoulders as if looking far into the distance. Shut your eyes and turn them to your third eye. Stretch your arms behind you, holding them up high and spreading your fingers apart. In quick succession, open and close your hands. Breathe long and deep. 3 minutes. c) Bring your feet together so they are touching; extend your neck and bring up your chin until your throat is stretched as far as it will go. Keep your mouth shut, and open your eyes wide. The Breath of Fire. 1-3 minutes. To end with, breathe in deeply and gently and bring your head back to the vertical. This exercise improves the memory. Listen to the whispering of the leaves, and the stillness that surrounds everything. Sit with your legs crossed and your back straight. Hold your hands in front of your chest, with your palms facing each other. Move your hands slowly and rhythmically as if you were clapping, but without touching. Stop when your hands are about 15 cm apart. Breathe in through your nose in 5 graduated steps, and out through your mouth also in five graduated steps. 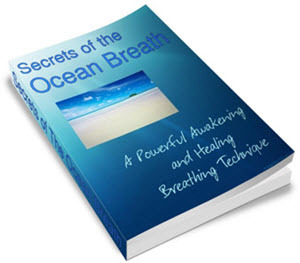 With every one of the five intakes of breath, move your hands close to one another in one movement. Breathe and move your arms in a unified rhythm. Concentrate on the energy that you may feel between your hands. 11 minutes. To end with breathe in, hold your breath, and strongly press your hands against your face for twenty seconds. Breathe out. Breathe in again, hold your breath, and press your hands to your heart for twenty seconds. Breathe out. 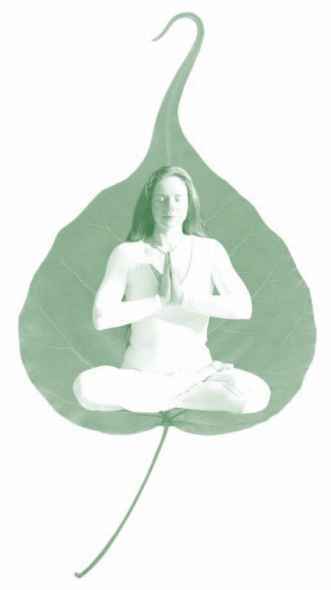 Breathe in and press your hands to your navel for twenty seconds. Breathe out and take it easy. This exercise is therapeutic for your electromagnetic field. While doing it, the energetic connection between your hands should be continuous. The Breath of Ten is a complete breath similar to the Breath of Fire. 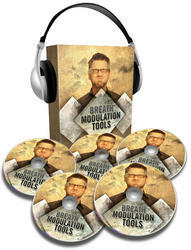 This exercise stimulates the regulatory system in your brain that controls your immune system. If you practice this meditation for 11 minutes a day, all of your chakras will be brought into a health-giving pattern. This will leave your body healthy and your spirit clear; a sense of energised peace comes about and your intuition is awakened.